On Sunday, Season 11 of the PokerStars.com European Poker Tour continued from the floors of the Grand Connaught Rooms in London with the £4,250 Main Event. A total of 224 players came out for the action in this starting flight, and by the end of the day the clock read that just 135 remained. Anatoly Filatov finished the day as the player to catch, accumulating 173,900 in chips for the lead. Filatov is no stranger to success on the felt, owning over $1.1 million in live tournament cashes. One of Filatov's most notable cashes came earlier this year when he finished runner-up to Fabrice Soulier in the EPT Vienna €10,000 High Roller. While Filatov bagged the chip lead, he was certainly not the only player to have success on the felt. 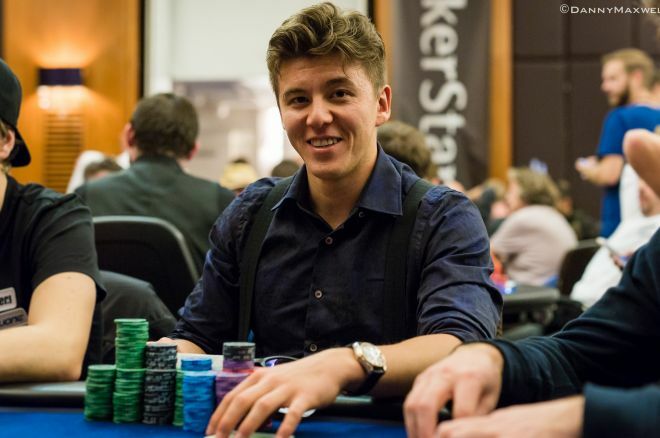 Team PokerStars Pro Johnny Lodden emerged as one of the larger stacks early in the day and rode that success all of the way through the end of the night. Lodden, who was well above the starting stack as early as Level 2, seemed to thrive around every turn during the first few levels of the day. Late in the night, Lodden had a confrontation with two-time World Series of Poker bracelet winner Praz Bansi that resulted in the latter's elimination. In the end, Lodden's outran Bansi's , allowing the Norwegian to add to his massive stack. Lodden finished the day on 125,800. Other notable players to advance to Day 2 include Hossein Ensan (124,900), James Dempsey (93,900), Niall Farrell (78,700), 2014 PokerStars Caribbean Adventure Main Event champion Dominik Panka (74,400), Marvin Rettenmaier (66,100), Sam Chartier (56,000), David Vamplew (54,300) Christoph Vogelsang (48,400), Eoughan O’Dea (44,200), and Max Silver (26,400). Team PokerStars had a stellar day as well, with pros Eugene Katchalov (74,300), Isaac Haxton (65,800), Leo Margets (54,200), Jake Cody (48,600), Fatima Moreira de Melo (37,500), and Jason Mercier (33,600) all bagging up for Day 2. While each of the aforementioned players thrived on the first of two starting flights, many other notable names gave it their all only to come up short. Some of the players who went bust before the final hand of the day was dealt include Martins Adeniya, Barny Boatman, Jannick Wrang, Aku Joentausta, Bruno Fitoussi, Steve O'Dwyer, Zimnan Ziyard, Sorel Mizzi, and Mathew Frankland. Another high-profile player who fell from play was WSOP November Nine chip leader Jorryt van Hoof. Van Hoof flopped top pair with top kicker against Simon Taberham's open-ended straight draw. Most of the money went in on the turn and Taberham was able to complete his straight on the river. Van Hoof called off the last of his chips and was eliminated from playin Level 4. Monday marks the second and final starting flight to this prestigious event. Players will once again flock to the heart of London with hopes of becoming the next EPT champion and earning what looks to be an astounding first-place prize. Day 1b will commence at 12 p.m. local time, where players will once again play eight 75-minute levels. As always, PokerNews will be on hand to provide all of the latest updates from the tournament floor.